Assin Manso, Slave River | Your Beach House in Ghana • Right at the ocean! 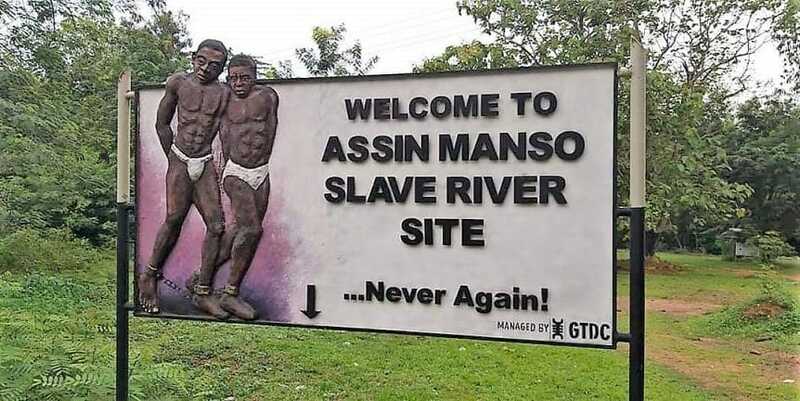 Assin Manso was the final link in the slavery route from northern Ghana, and it was known to have been the largest slave market for merchants supplying slaves to the forts and castles along the coast. Former slaves from the Americas, Samuel Carson from the USA & Crystal from Jamaica, were re-interred here in 1998. In addition to the cemetery, the Slave River can be visited as well. Slaves that were brought from northern Ghana and were washed and sorted before selling them to the merchants. The river where the slaves washed themselves is called ‘NNONKO NSUO’ meaning Slave River.